George Shafer Jr., 91, of Belleville, IL, born August 28, 1927, in Bartholomew County, IN, died Saturday, February 2, 2019, at Randolph County Care Center, Sparta, IL. Mr. Shafer was a representative for the Aid Association for Lutherans, now Thrivent Financial. He was one of the initial inductees into their hall of fame and was a member of the Life Underwriters Association. 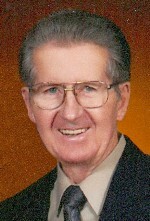 George was an active member of St. Mark Lutheran Church in Belleville. He volunteered at St. Mark’s Food Pantry and also with the Financial Crisis program at the church. He was a U.S. Army veteran. George loved to play games of all kinds, board games, card games, yard games, and everyone had to be involved in the games when he was around. He was preceded in death by his wife of 68 years, Anita, nee Hoeferkamp, Shafer, whom he married December 4, 1949, at St. Paul Lutheran Church, Jonesville, IN; his parents, George Sr. and Ruth, nee Lewellyn, Shafer; two brothers, Robert and Clarence Shafer; and a sister, Bernice Goodman. Memorials may be made to St. Mark Lutheran Church or to Bread for the World – Lutheran World Relief. Condolences may be expressed to the family online at www.rennerfh.com. Visitation: Friends may visit with the family from 4 to 8 p.m. Thursday, February 7, 2019, at George Renner & Sons Funeral Home, Belleville, IL, and from 10 to 11 a.m. Friday, February 8, 2019, at St. Mark Lutheran Church, Belleville, IL. Funeral: Funeral services will be held at 11 a.m. Friday, February 8, 2019, at St. Mark Lutheran Church, Belleville, IL, with Rev. Brian Robison officiating. 3 Comments on George Shafer, Jr. Sorry to hear about your father, Mary. I know you will miss him. Our prayers are with you. Mary and family: We offer our sincere condolences for you and the family. Sad we keep meeting under these circumstances. See you later this week. God's blessings!